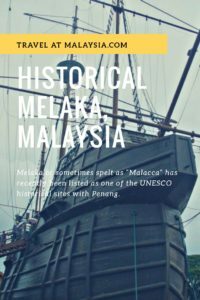 Melaka or sometimes spelt as “Malacca” has recently been listed as one of the UNESCO historical sites with Penang. There is a lot see and stepping in the historical part of Melaka, is like stepping back in time. It’s where I grew up, so naturally I love my little state. Getting here is easy as most major highways link to Melaka. You can travel by the North-South Highway from the Kuala Lumpur International Airport takes only one and a half hours and from KL its about 2 hours. From Johor Bauru you head north, it’s only 2 1/2 hours. The highway roads to Melaka is large and with good quality. Along the highway there are many public rest areas, stop-over and petrol kiosks. This is a replica of the Melaka Sultanate palace which sits at the foot of St.Paul’s Hill. It was built based on sketches found in the ancient Sejarah Melayu (Malay Annals). The building is made of hardwood and an interesting feature of the building is that no nails were used in the construction of the building. They used only wooden pegs. The building is a museum of items link to the Melaka Sultanate. A Famosa, or in Portuguese “The Famous” Is part of a fort built by the Portuguese when they captured Melaka. The fort suffered severe destruction during the Dutch invasion of Melaka and what’s left today is just the entrance. But recently they have found parts of this fort while digging to put foundation for a building. There are even rumours that there are secret walkways that leads to the Stadhuys and St. Paul’s Church built as an escape route during a siege. But it was sealed up for safety reasons. Built in 1650 as the official residence of the Dutch Governor and his officers. It now houses the Historic Museum and Ethnography Museum. The building is easy to spot as it is painted red which was the original colours of the building. Nearby, there is the Christ Church also painted red and built in 1753. Below the Stadthuys there are shops selling souvenirs for you to bring home. Hang Li Poh was a Chinese Princess during the Ming Dynasty who was betroth by the Emperor of China, to Sultan Mansur Shah to strengthen ties between China and Melaka. Her entourage then settled down in Bukit China. Bukit China is believed to have the largest Chinese cemetery outside China, with many tombs dating back to the Ming Dynasty. Her followers built a well in 1459. Rumour has it that the well have never dried up even when Melaka faced water shortage in 1988. Kampung Keling Mosque The Kampung Keling Mosque is one of the oldest mosques in Malaysia. Built during the 17th century. Its architecture is a blend of Sumatran and Indian architecture with a 3 tier pyramid roof. The carved wooden ceiling is supported by elegant Corinthian-styled columns. Cheng Hoon Teng The Cheng Hoon Teng temple was constructed in 1645 and is believed to be the oldest Chinese temple in the country. The eaves of the temple are decorated with Mythological figures and animation made from broken glass and porcelain. 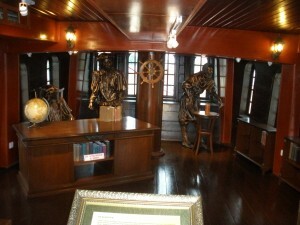 The wood carvings and lacquer work are almost breath-taking. A good camera is a must when visiting these historical places in Melaka. Hang Tuah’s well Hang Tuah was the leader of the five famous and legendary warriors of the Malacca Sultanate. He was known for his loyalty to the Sultan that he even was willing to kill his best friend Hang Jebat on the orders of the Sultan even though his best friend was avenging his unfair death sentence that was given by the same Sultan. Hang Tuah’s well is located in Kampung Duyong. The well is said to be the abode of his soul which takes the apparition of a white crocodile. Jonker’s Street Jonker’s Street, once the rich man’s street is now a living proof of Malacca’s rich baba-nyonya heritage. The artichature of the building is preserved by the state government with very strict regulations. The street is also famous for its antique shops. The best time to visit this street is during Chinese New Year when there are hundreds of red lanterns hanging across the street. Maritime Museum The Maritime Museum is actually a replica built according to the former Portuguese ship named “Flor De La Mar”. In the museum, you can get a closer look at Malacca Maritime history from the Malay Sultanate of the 14th century to the Portuguese era, the Dutch era and the British era. St. John’s Fort St. John’s Fort was rebuilt by the Dutch during the third quarter of the 18 th century. The was built with their guns mainly facing inlands as at time attacks mainly came from land that from the sea. The fort was once a private Portuguese chapel dedicated to St. John the Baptist. As Melaka was ruled by three major Chatholic Countries you will find lots of ancient’s churches around this tiny state. Apart from the Christ Church next to the Stadhuys, there are few more and two of the ones listed below are still being used by Christians. St. Paul’s Church On top of St. Paul’s Hill is the St. Paul’s Church, which originally is a Portuguese chapel built in 1521… St. Francis Xavier was buried here in 1553 before his body was moved to Goa, India. In 1952, a statue of St. Francis Xavier was built. But on the day of the consecration ceremony, a large casuarina tree fell on it and broke off the right arm, resulted in a statue with missing arm until today. There are some stories that it was hit by a bomb during World War Two. St. Peter’s Church St. Peter’s Church was built by descendents of Portuguese soldiers in 1710. It was built after the Dutch administrators relaxed the rules to allow the construction of a Catholic church. The Church as with St. Francis Church is still being used as a place of worship by Catholics and Christians. The main highlights of this Church are during Good Friday and Easter, when people from as far as Singapore come to worship here. St. Francis Xavier St. Francis Xavier’s Church was built in 1849 by a Frenchman, Reverend Farve dedicated to St. Francis Xavier. The Gothic towered church is believed to be based on the model of the Cathedral of St. Peter in Montepellier, Southern France. In my next post I will be posting on some other places that you can do in Melaka. With a little review of two hotels that I have stayed in.